Stephen Covey nailed it. Effective listening is an art. Great conversationalists listen more than they speak. They don’t listen to reply; they listen to understand what the other person is saying. Our eagerness to don the agony aunt hat makes us rush in with good advice and in the process we lose focus on what the person is saying. It happens everywhere - you’re discussing a problem & your friend keeps interrupting you to provide solutions, your sister is talking about her son’s poor performance in school & you’re mentally jotting down 10 points on how she can improve kid’s academic performance, your co-worker is talking to you about her marriage woes & you’re already googling divorce lawyers! Learn how to make effective listening at the center of your social media marketing strategy. They're basically empathetic listeners. Here we discuss 5 scenarios where businesses listened to their consumers with an intent to understand and then acted accordingly. Peter Shankman was hungry before he boarded his flight. So, he jokingly tweeted to Morton's Steakhouse asking them to meet him with a porterhouse steak when he landed. And they did! In 2010, Dell had launched its social media listening command center to listen and engage with their customers across all social media platforms. The Listening Command Center is a place where we monitor more than 22,000 Dell-related topic posts on average—and that's a number that will probably continue to grow. Average daily mentions of Dell on Twitter alone have a greater reach than the combined circulation of the top 12 daily newspapers in the United States. We have noticed the web interest for some time and the consumer passion has undeniably swayed our opinion to relaunch Wispa...This is the first time that the power of the internet played such an intrinsic role in the return of a Cadbury brand. Samsung politely denied the request. But they liked the drawing of the dragon and to say thanks they sent Shane drawing of a kangaroo on a unicycle. Shane was so happy that he posted the conversation on Reddit and the thread soon became viral. Soon, it came to Samsung Canada's attention and the company sent Shane the phone he asked for. They even customized it with his fire-breathing dragon image. This tweet went viral for obvious reasons with 16,000+ retweets and 12,000+ likes. Thank god that someone was monitoring and listening to Waterstones' social accounts David Willis was freed. 3. Social Media Listening - What Do Customers Expect From Businesses? 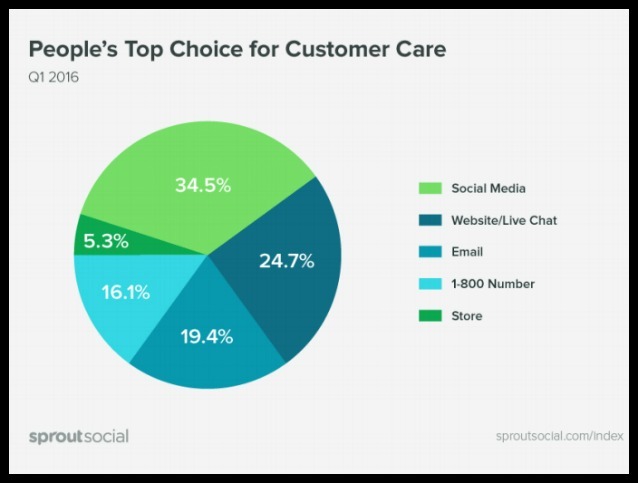 Social media is the first place where majority of customers turn to when they pace issues with a business's product/services, according to a report from Social Sprout. Listening to your customers in real time over social media is a great way of spreading word of mouth & generating sales than cold calls and impersonal e-mails. In his book Hug Your Haters, Jay Baer says "answering a complaint on social media increases customer advocacy by as much as 25%." Here're some more telling stats that emphasize the need for empathetic listening to customer queries on social media. Responding to a tweet or facebook comment doesn't in anyway equal a successful social customer service, as these conversations prove. "Companies are really looking at this more as a PR play as opposed to fixing the root cause of the problem, and that makes me really sad, ... Companies do not want to talk to you, and it shows. The fact is most do not want to tweet with you either." Airline delays can be frustrating. And dealing with frustrated customers enquiring about fllght delays is nothing short of nightmare for an airline company. Below is an example how Jet Blue responded to an angry customer with humility & wit. Comcast's Twitter Handle @ComcastCares, the brainchild of the then comcast executive Frank Eliason, responds to every customer complaint seven days a week. In 2008 when Frank started, Comcast had some serious issues that needed urgent intervention. Apart from negative comments on Facebook, Twitter & other social channels, someone posted a video on YouTube showing a Comcast cable repairman falling asleep on the customer's couch while speaking to someone in the office & it went viral. In 2009 H&R Block launched the Get It Right campaign with the only purpose of answering people's tax problems. The advisors answered everyone's questions, irrespective of whether the user was H&R customer or not. According to Zena Weist, Director Social Media at H&R Block, listening is at the center of their communication strategy. It's listening to what your clients want and making sure your strategy aligns with what your customers are saying out there. If you can repsond to them, with retention comes acquisition. We're trying to listen to what our clients and prospects want. We don't wedge ourselves into the conversation. If they ask, we repsond with one brand voice. We practice active listening, by responding to the request without pushing out a marketing message. That's a tough formula. For us it's about being a part of the conversation where it's appropriate and providing needed content. But What Happens When There're 50 Customer Queries In A Second? For brands that receive thousands of messages in a day, manually checking and then responding to every query in real-time is taxing. For this reason, many businesses are trying to find the solution in chatbots powered by Artificial Intelligence that understand the context of the message and then reply accordingly. Over here we discuss how some major brands are exploring Chatbots in a big way to engage with their customers. Users who opt into Amex bot will recieve transaction alerts and purchase related content. Messages ensure that the users get the maximum benefit of being Amex card holders. Messages are on useful and relevant themes - from special restaurant recommendations paired with a hotel reservation to tips to access Amex's complementary lounge services. "We're trying to serve the customer in this more conversational way," Matthew Sueoka, VP of digital partnerships and development at American Express. The chatbox lets users order tacos in a slack conversation. It can answer questions, recommend food items, organize group orders and also facilitate orders. And last but not the least, know where your audience hangs out. It's where you need to be. Here's a great read on how to research and locate your audience using social media. TechShu - We suggest creating an active Twitter presence. Your customers are talking about you on Twitter. Marketing Head - No, we don't want to do Twitter now. Marketing Head - Because I don't use Twitter. You don't use a particular social channel, that's fine! But that in no way means that your customers aren't present there and what's more they're not talking about you there with their friends & followers. Here're some interesting facts on social media engagement. Want to add something to list? Share with us in the comments section.